I'm not sure where Tower number 1 was, but I guess it was fairly close to Tower 2. Tower 2 became quite substantial over time and morphed into the TAA and East West Airlines terminal by the 1970s. It's still there, embedded into the Qantas domestic terminal. Tower 3 is also still there, near the intersection of 16/34 and 07/25, and is a fire station. Tower 4 is still there, near the (relocated) Cooks River mouth. And Tower 5 is the active current tower. History of Sydney Airport in pictures, number 6 in the series. This overview shows the lot. We have the old river course (dotted blue) and the new (solid blue). The original railway is dotted orange and the deviated line is solid. The original Cooks River bridge and associated roadway to Kyeemagh (including Lord's Rd) is dotted purple, the current motorway solid. Ascot Racecourse is in yellow. You can see all of the current runways and how they are placed against these changes. History of Sydney Airport in pictures, number 5 in the series. 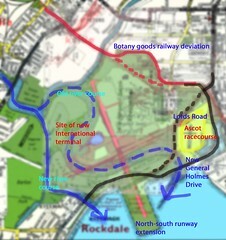 In this overview of changes apparent between 1940 and 1966 we see the Botany Goods Railway deviation (red line, original route dotted) and the Cooks River in its original course (dotted blue) and altered course (solid blue). 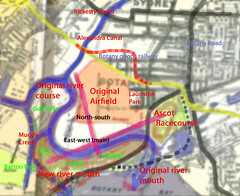 Ascot racecourse is shown in yellow but was of course closed and overlaid in the mid-50s by the 07/25 runway, shown here faintly in pink. Also shown in pink is the slightly-extended 16/34 runway, yet to be taken fully out into the bay. That extension as shown caused General Holmes Drive to be laid into a cutting where it went under the runway. General Holmes Drive (in solid black) replaced the Lords Road/Government Rd combination (dotted black) that was also cut in the mid-50s by the east-west runway. 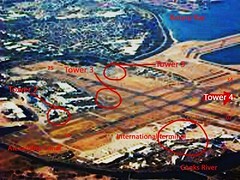 The International or Overseas terminal was still sited at Lauriston Park, near the TAA terminal (later to become Australian Airlines and then Qantas domestic). History of Sydney Airport in pictures, number 3. Some detail that appears when you compare a 1954 map with a '65 one. You can see that the new runways - short 16/34 and main 07/25 are in place and the remaining roadways renamed. There's a tram balloon loop on Lords Road in 1954 that used to serve the Ascot racecourse. The railway has deviated to the north, leaving room for Qantas to expand. History of Sydney Airport in pictures, number 4. Big changes. 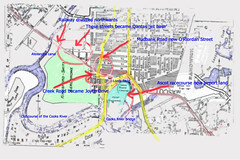 Cooks River was shifted west, with the roadway to Kyeemagh largely removed or relocated. Polo and cricket grounds and the golf links to the west and south were also removed or relocated. Ascot Racecourse was absorbed. My potted history of Sydney Airport in pictures, part 2. Comparing and contrasting street directories by Premier, Robinson and Gregory's, here we are looking at what happened between 1940 and 1954. Please forgive me if you disagree, oh map-makers and publishers, but I think this is "fair use" - or re-use - of your art. Starting from the north, Ricketty Street bridge is just such a great name that I have to include it. It spans one of only 3 industrial canals in Australia, and is still worth a visit today. The original goods railway line is shown in yellow, with the northward diversion in pink and orange. I have shown where the suburb of Lauriston Park was, and Ascot racecourse in relation to the concrete (main) east-west runway (in pink) that was laid by 1954. 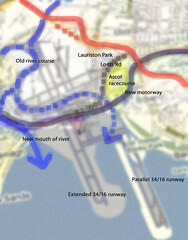 To build that and the new but then-shorter north-south runway involved diverting and filling the course of the Cooks River (in blue). That was quite a project. Imagine trying to move a river now - you'd need to be pretty sure about how the changes would impact the local ecology, for starters. Anyway, the Bonnie Doon Golf links in the north-west corner were replaced with what later became the International terminal and the cargo precinct. More recreation grounds were lost - a polo field, a cricket ground and another golf links to the south. And the main runway now ended where Ascot racecourse was in 1940. Muddy creek was also shortened in the whole process of moving the Cooks River. The dotted black line shows the new General Holmes Drive, replacing the old road, the bridge and Government Rd, all marked in brown. Some residences were left stranded by these changes, particularly those near the southern end of the short 16/34 runway. These houses were "on" General Holmes Drive until the mid-1960s, when the road was diverted into a cutting to the south and bridged-over with the extended north/south runway. I think it's extraordinary what we did to create Sydney Airport at Mascot and it's worth revisiting the story occasionally to remind ourselves of both what we have created and what we have lost. Thus begins my potted history of Sydney Airport, in pictures. It really started in the early 1920s with Nigel Love leasing land from the Ascot Racecourse and Recreation club, to the west of the racecourse, immediately west of the suburb of Lauriston Park, shaded green here. It was flat but boggy ground, bordered by Shea's Creek to the west and Cook's River to the south. 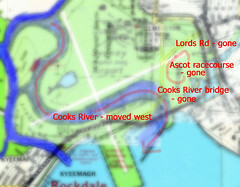 I have shaded the Ascot track in blue. It's shown on both the 1926 and 1940 Premier and Robinson street directories, but disappears by the 1950s. That racecourse area became, variously, vacant land to the east of the threshold of runway 07/25; the Flight Facilities or GA area to the northeast; the east-west runway threshold itself; and what is now long-term parking. You can see that Lord's Rd and the Cooks River bridge (in yellow) were still around in 1940, but disappeared when the river was diverted and the new concrete runways built (in the mid-1950s). To the north is the Botany Goods Railway. You can see it is a straight line here, both in 1926 and 1940, but was later diverted to the north. Grass and gravel runways pointed roughly north-east to the south-west, and east-west during this period. The northeast threshold was cut by the railway line and one incident occurred when a DC3 collided famously with a goods train! 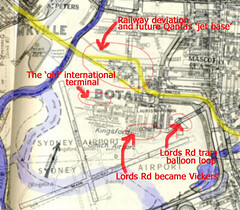 The streets to the north were subsumed into the airport after the railway diversion, later becoming part of what Qantas called its "Jet Base" with the advent of the 707. To the south are recreation grounds.